All solutions are specially designed to make sure that the exact requirements of its customers are met. Which is why Paxiom Group is known for offering one of the few true tailored packing solutions in the business. First of all, on our list is the semi-automatic case packing that utilizes The BoxxPak machinery. This packing machine (see our machinery demo videos) makes use of the combination of case erection, hand pick stations, and tape sealing in a compact and efficient work-cell. 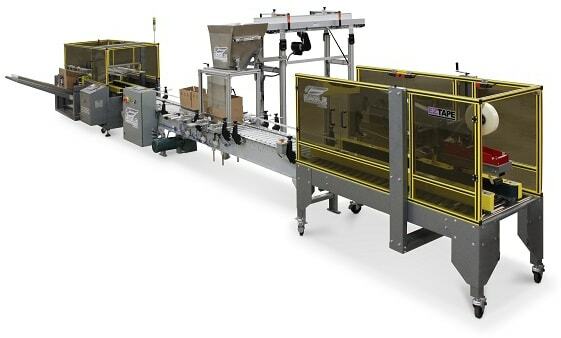 The main function of this well-designed pick and pack system is to arrange the cases and product in a manner that will optimize the handling of products for the operator. Furthermore, this also effectively lessens monotonous motions of the wrist and arm. This alleviates operator discomfort, which in turn, positively contributes to productivity. The BoxxPack allows versatility due to its 4-speed variables; 1,2,3 and 4.Different product sizes, weights, shapes, and materials can be swiftly and simply packed in a wide array of case sizes. Another is the auto side loading with its compact case packers. EndFlex offers a machine that operates a system to automatically side load cartons, jugs, containers and boxes. Its case packers are engineered so that it will enable it to glue or tape a corrugated case, and what’s more, it only requires minimal maintenance and is a breeze to use. In addition, the automatic drop case packing and loading. This packing application takes the form of an automatic and robotic case packer. That is built to drop pack cartons, jugs, containers and boxes. Same as the compact case packer, this one also requires little maintenance. Finally, our list would be our automatic pick and place solution for case and tray packing which makes use of modular pick and place systems to produce a wide range of pack patterns. Consequently, this packing system has been proven to remarkably increase efficiency and productivity.